Although Winthorpe probably had a Saxon origin, it is obvious from "thorpe" that the Danes settled here also. Nottinghamshire at the time of the Domesday census had a population of only about 20,000, smaller than the present population of Newark, so the villages strung along the river must have been small indeed. For centuries most villages had their open fields stretched around them, with cart-roads for access, and in the early years, when Winthorpe had no great resident land­owner, there must have been only a little and gradual enclosure. The Enclosure Award of 1778 relating to Winthorpe indicates some parts of the village which were already old or "ancient enclosures" of which the following are examples (see map), The Cauls (or Calls) and Furrow's Marsh (Nos. 3 and 4), Tomlinson's Marsh, Skelton's Marsh and Blank Marsh (Nos. 8, 9, 10), Poor's Marsh (No. 12), Buller's Little Marsh (No. 14), Town End Close (No. 19), Meadow Close (No. 26) and the North and South Pasture Closes (Nos. 55 and 56). Dr. Max Hooper of the Nature Conservancy's Experimental Station in Huntingdon has suggested an interesting method of dating hedgerows, which might be profitable to follow up in Winthorpe. "There are two or three species characteristic of older hedges - field maple, spindle and Midland hawthorn. If a 30-yard stretch of hedge contains 10 species of shrub, the chances are it is of Saxon origin. One can take as a rough guide that hedges have one species of shrub in a 30-yard length for every 100 years of the hedge's existence." If the hedge were planted after the Enclosure Act, it usually contains only one or two species of shrub, i.e. hawthorn plus a second variety, elder if the soil is sandy, or willow if the soil is damp. The Enclosure Award of 1778 concerning Winthorpe mentions that "the outermost or ring fences of several parcels of land should be planted with young quicksets which should be guarded on the outside by good and substantial oak stoops and oak rails and a four feet ditch and on the inside by the like good and substantial oak stoops and oak rails and a four feet ditch with good and substantial gates." In addition to these imposed and stipulated divisions there was also internal division by landowners of large allotments. In this connection should be mentioned the many lines of elm trees which have existed in Winthorpe well within living memory, one long line along the Gainsborough Road, bordering Mr. Euston's property and that of the Grange, and another line down Holme Lane as far as the level-crossing. Only within the last year have the last of these been cut down, and as they all appear to have been about the same age, it is possible that they might have outlined the borders of the Pocklington estate in Winthorpe at the time of the Enclosure Award. In Winthorpe it is easy to be so mesmerised by the presence of the Fosse Way, (the Roman road running from Bridport to Lincoln) that one forgets other more local by-ways which may be quite as old, the Drove Road to Coddington, used for the movement of cattle from village to village, or Pasture Lane (so called in the Enclosure Award) which is now only a footpath across the Park, used to move cattle or sheep from the village to the old pastures, the pinfold or to the open fields, and Hargon Lane. (The pinfold or pound for stray cattle does not survive except as a field name, Pinfold Close.) We have not traced the derivation of "Hargon," the O.S. map shows the lane as "Hykeham." A further lane existed across the present airfield to Coddington, and in fact, on the Civil War map drawn by Clamp, this appears as a sizeable road, crossing the Gainsborough Road at the village green by the Lord Nelson Inn and continuing to Holme and, in the other direction, to Coddington and on to Balderton and Hawton to Farndon. The Gainsborough Road itself, running along the ridge through Winthorpe, Langford, Collingham and Besthorpe, must be a very ancient roadway linking the early settlements. The Enclosure Acts usually ordered the construction of new local roads to give access to distant properties, and these are usually designated "occupation roads" or "thoroughfare roads," as happened in Winthorpe. 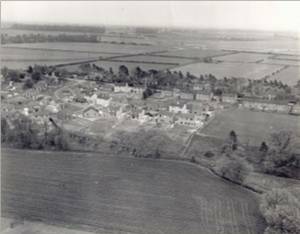 In addition, extra farm houses often had to be built to serve the new properties and Carr Farm, which stood in the middle of the present airfield, was one of these. It was demolished when the airfield was constructed. Until the early eighteenth century, Winthorpe appears to have had only a number of small property owners, among whom, in the years 1700-1750, are the following:- James, Gregg, Hoole, Skelton, Ellis, Brandon, Sharpe, Malton, Hutchinson, Billiat, Alvey, Inkersal, Powell, Foster, Brough, Crow, Buller, Gilbert, Farrow, Eyre, Ashwell, Wilton, Hazard, Pocklington, Vason, Morley, Heron. (Some of these names had been mentioned in Brewer's Will in 1614.) 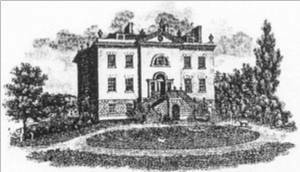 There was a large family of Taylors, but they do not in the early years appear to have been the owners of property until we find John Taylor's sisters Ann, who married Inkersal, and Elizabeth who married Gregg. These sisters, in their widowhood, inherited small properties in Winthorpe. John Taylor, their brother, is described by Henry Hage as being a publican who kept the Turk's Head in Newark. (This was in Kirkgate, on the corner of Middlegate, where the Turk's Head sign can still be seen above a shop.) His son Robert was born in 1709 and became a doctor who practised in Newark and became successful enough to marry in 1739 Ann Heron, the daughter of John and Jane Heron of Winthorpe, and the sister of their son and heir Robert Heron who was the largest land-owner in Winthorpe. Dr. Robert Taylor and Ann settled in Newark; they had no children. In the 1740's Robert Taylor had a stroke of good fortune. He was summoned to Belvoir Castle to attend the Earl of Burlington who had been taken ill there. His treatment proved successful, and in consequence the earl's grateful wife persuaded Dr. Taylor to come to London, where she was the means of introducing him to a wealthy and noble clientele, and ultimately obtaining for him an appointment as Physician-in-Ordinary to George 111. Dr. Taylor and his wife lived in Berkeley Square and prospered so well that in 1753 the doctor began to buy houses and land in Winthorpe with a view to retirement there. By this time he had amassed a good deal of property in Winthorpe and had become a considerable landowner there. His wife Ann had died in 1757 leaving no children, but he then married in 1759 Elizabeth Mainwaring of The Close, Lincoln, "a relative of Thomas Mainwaring in the county of Lincoln, Esquire." She was 33 and he was 50. This was a good marriage for him, but it necessitated a settlement on the bride; she was to bring him a dowry of £5,000 and he in return had to settle all his Winthorpe property on her and her heirs. A daughter Elizabeth was born in 1761, and later a son who died in infancy. This handsome dowry enabled Dr. Taylor to set in hand the building of Winthorpe Hall, "to spend great sums of money in the erection of this mansion house and in enclosing with a wall and planting a piece of ground for a kitchen garden, in erecting and building hot-houses in such kitchen garden." Unfortunately the doctor's dreams of retirement in his country mansion were not to be realised, because he died in the following year, 1762, and his wife was left practically penniless with the house unfinished. He had spent all his money in acquiring property, there was no money to continue the building and the rents brought in only £119 per annum. Henry Hage's letter shows how far Dr. Taylor had over-reached himself. He was buried in London, but the body was later brought to Winthorpe in 1778. Elizabeth could not sell the property as it was settled on her for her lifetime and in trust for the child, and for three years the building remained unfinished. Then Roger Pocklington, the son of William Pocklington whose property Dr. Taylor had already acquired, offered the trustees £8,000 for the whole estate if an Act of Parliament could be passed to set aside the Will and allow the sale. This was obtained in 1765 and Roger Pocklington became the new owner. He was a descendant of an old and respected Collingham family. He was a co-partner with William Dickenson and William Hunter in a bank at Newark (which later became Peacock's and then Lloyds Bank). It was left then to Roger Pocklington to complete the building of Winthorpe Hall. It is not known who was the architect, and it is possible that Roger Pocklington may have modified the original design. (Nikolaus Pevsner dismisses the Hall briefly as "Brick, Late Georgian, with pediment and Venetian window, but also with the mid-Victorian addition of a Mansard roof.") It is interesting to compare the early prints of Winthorpe Hall which accompany this account, with the more recent photographs, and to notice the various changes:- in the centre "Venetian" window for instance, in the extension of the building on the right, in the raising of the roof level, and in the addition of urns, which have now, alas, disappeared. Roger Pocklington, whose wife Mary was the eldest daughter of W. Roe, Esquire, of Sudbroke, Lincs., had many happy and prosperous years in Winthorpe. A son Roger was born in 1775, and a daughter Elizabeth in 1776, and at about the same time the Enclosure Award helped him to consolidate his estate by various exchanges which brought his property in Winthorpe largely within a ring fence. As a contrast to his predecessor Dr. Taylor, his exchanges were in the main generous towards the villagers and the Rector. These were prosperous years for the family. 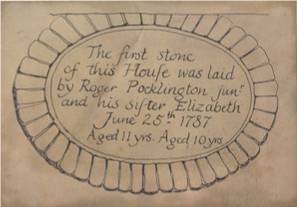 Roger Pocklington was now the patron of the living, and he was instrumental in repairing the church, where his infant son laid the foundation stone of a new tower in 1779. He undertook many local commitments, as Surveyor of the Roads, a guarantor for repairs to the charity house, etc., and his signature appears on many documents concerning parish affairs. Towards the end of the century he built The Grove for his son Roger on his marriage; the same architect may have been employed because there are many resemblances between the Hall and The Grove. Young Roger and his wife, Jane, had a son born in 1802; he was also christened Roger, so there were now three generations called Roger Pocklington. Unfortunately, the early years of the nineteenth century brought money troubles to the family. The oldest Roger Pocklington, now about seventy years old, was still a co-partner in the Newark bank, which in turn was associated with Samuel Raynes in a bank at Retford. In 1803 both banks had become heavily indebted to their London bankers, who demanded security to the amount of £120,000. The Hall and the estate were sold on behalf of the debt to the London bank, and the property was bought (according to White's Directory 1853) by Slingsby Duncombe, who is shown on the Enclosure Award Map of 1778 as being the owner of the land in Langford immediately along the boundary with Winthorpe parish. White adds that Lord Middleton then acquired the estate in 1832. There seems to be some confusion about the names of the owners of the Hall at different dates in the nineteenth century. For instance, Hage's letter dated 1823 states that "The Rev. E. Bacon Frank, M.A. of Campsall Park, Yorkshire, is the present proprietor of Winthorpe Hall." Perhaps the word "proprietor" here may be assumed to mean "tenant." An excellent Fire Engine with Pipes, Buckets, etc. Brewing Vessels, Kitchen Utensils, etc." One wonders how many days it took to disperse all of this. Winthorpe has been described recently as one of the best-wooded villages in the county, and this must largely be due to the work of Dr. Taylor, Roger Pocklington and later owners of the Winthorpe Hall Estate, who landscaped the Hall grounds and planted hundreds of trees which have been cared for and replaced until quite recent times. The Enclosure Award map shows how extensively the Hall grounds were planted, the area of the park end and also the woods in the further fields for the preservation of game. It is not known how long ago the two Wellingtonias were planted which marked the back entrance to the Hall grounds on the old coach drive from Holme Lane. They are immensely tall and handsome trees still, and form part of the village treasures. Lord Middleton, a Yorkshire land-owner who had bought a good deal of property in this area, held the Winthorpe Hall estate together until 1867, the Hall itself being rented by various notable local people, including Mr. Grosvenor Hodgkinson, who was M.P. for Newark, and a son of Mr. George Hodgkinson, a solicitor of Newark, the firm of solicitors which is now Hodgkinson & Tallents. Alderman G.R. Walker owns a copy of the Sale Catalogue of 1867, which he has been good enough to lend to us). The title-page is reproduced with this account, partly because the print is in itself so attractive but more because of the romantic picture the auctioneers give of the appearance of the village over a hundred years ago. In addition there is a list of some of the field names, which shows that there had been further sub-division of fields following the time of the enclosure map of 1775, and part of the 1867 map has also been reproduced for comparison with the earlier one. From Dr. Taylor's time on, there had been a gradual gathering together and concentration of property into the Hall Estate, but from the time of the sale in 1867 until now, the story has been one of gradual dispersal. We have found it necessary to dwell in some detail on the story of Winthorpe Hall because so much of the village was involved in it. 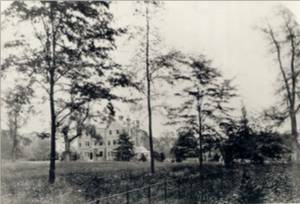 Several of the larger houses, like The Grove, The Grange and Winthorpe House were sold at the time of the sale in 1867, while the Hall itself was bought by Mr. G. Pierce Duncombe. There was further dispersal at a sale in 1907 when Mr. Duncombe left the area and Captain Need and his wife became the new owners of the Hall. 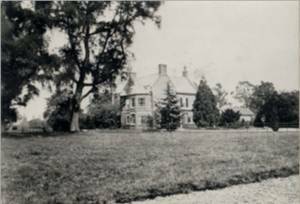 By 1937, when Captain Need left, the great estate included only the Hall, Old Rectory Farm, Low Wood and the Carr Farm, with a total area of 540 acres. Since the second world war, much of the old Hall garden fronting the Gains­borough Road has been sold for private development to owners who value and appreciate the old established grounds and trees and the wonderful view over the fields to the river. The Hall itself is now almost 200 years old, and although it is on the list of protected buildings, its future seems uncertain because of its uneconomic size and the enormous sums that would be required to convert or restore it. Extracts from the Particulars of Sale of Winthorpe Hall Estate 1937. "The Hall with its massive two-branched flight of stone steps on the South front, presents a moat striking appearance. On the Principal floor is a stone-flagged entrance hall, measuring 25 ft. by 19 ft. partially divided by a pair of Ionic columns. To the left of this Hall is a beautifully proportioned and most pleasant lounge, measuring 30 ft. by 30 ft. (inclusive of a large bay) with windows overlooking the terrace, park and river Trent. This room has an oak parquet floor, statuary marble mantel, decorative ceiling, a gilt-fitted surround to one window, a large oval gilt mirror, and gilt overmantel. Communicating with this room is an office about 20 ft. by 10 ft. well lighted (as are all the rooms) and having pretty views of the lawns etc. Leading from the office and also approached from the hall is the Drawing Room; another very delightful room, measuring 24ft. by 20 ft., also enjoying views of the grounds and having a stone mantel and enriched ceiling. To the right of the hall is the Dining Room, facing south with modern fireplace having an oak mantel. This room measures 21 ft. by 18 ft. From the Inner hall a short passage leads to the Billiards Room, measuring 28 ft. 3 ins. by 17 ft. 3 ins. with polished oak floor and handsome carved oak mantel with large mirror. The Principal Staircase is of oak and mahogany and leads to a well-lighted corridor with three Principal Bedrooms and a dressing-room on the South Front and another excellent bedroom overlooking the lawns. One of the south bedrooms communicates with a bathroom. On the second floor are four spacious bedrooms, two other bedrooms, and a bathroom. The Kitchen Quarters are conveniently arranged on the ground level and com­prise kitchen, scullery, larder, two store rooms, Servants' Hall with large fitted cupboards, two wine cellars, linen room with fitted cupboards, Butler's Pantry with same etc. The outbuildings comprise dairy, Kennel, Blacksmith's Shop and Carpenter's Shop corn place, crew yard, piggeries, calf place and 4 loose boxes, harness room, stables, garages, chauffeur's cottage etc. The gardens are particularly beautiful. A terrace walk flanked on one side by a yew hedge extends the full length of the West Front of the Hall - this walk leads to tennis and croquet lawns surrounded by a wealth of Lily-matured trees. A further walk leads to a teak-built mush room-shaped seat and from this point a wilderness walk through old elms and chestnuts, with a fish pond in the declivity on the west side, joins up with the north carriage drive. Opposite the entrance to the main carriage drive a path leads through an arched door to a fine walled-in fruit and kitchen garden, intersected with box-edged gravel paths. The buildings comprise vinery and peach house, span-roof greenhouse, cucumber and melon house, fruit room, etc. Inside the garden is the head gardener's picturesque cottage." We have now to go back and pick up the village story once again with the Enclosure Award of 1778 and the map which William Attenburrow, one of the Commissioners, had ordered to be made in 1775. This Award was "an Act for dividing and enclosing several open fields meadows and grounds commonly called or known by the several names of the Old Field Pasture, the Middle Pasture, the Long Hollow Pasture, The Carr and the Rundles. The owners and proprietors of the said open fields etc. have for time immemorial enjoyed rights of common during certain seasons of the year according to a certain stint or rate. The grounds of various proprietors lie inter­mixed and scattered therefore it is advantageous to the same to have them divided and enclosed and exchanges made." The Commissioners therefore set about the invidious task of sharing out the open fields so that all those with rights had a fair share of the good and bad land, and of exchanging and gathering together scattered properties, a tidying-up operation which had to take into account all the relative values. Certain exchanges that had already been privately made had also to be confirmed by the Commissioners. The document (a copy of which is in the Parish Chest) is long and complicated, and only a few parts of it will be mentioned here. It is obvious that Roger Pocklington, as the chief landowner, was the one most involved. He made many exchanges of property with some of the smaller holders, William Hoole, Henry Preston, Bridget Eyre, Anna Maria Buller, Williams Sims and others; and he made some important exchanges first with the Rector and secondly with the Trustees of Brewer's Charity, which greatly improved the Hall Estate by bringing most of it within a ring-fence, so that Pocklington's hall grounds now stretched from the Newark boundary by the bridge over the beck, along the Gainsborough Road as far at the centre of the village and then along Holme Lane. 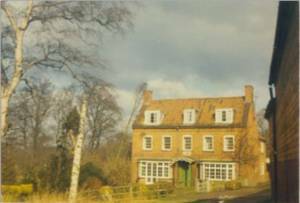 The Rector (who at the time was William Rastall) gave to Pocklington his Rectory with its barn and stable yard and garden, and also the pieces of land known as Little, Upper and Nether Wong and the Glebe Marsh. The rectory is described as "all that ancient House or Tenement with mud walls and thatch, also that Barn with mud walls and thatch., also all that yard and garden thereto adjoining, the land of the said Roger Pocklington being north and south, the Glebe Marsh west and the old Lane east." This can be identified as the area marked "I" and "H" on the enclosure map. The old Lane, which now became a private road through Pocklington's grounds, is the present coach drive from Holme Lane to the back of the Hall. In return, Pocklington gave to the Rector several pieces of land, Malton's Marsh, the north part of Clark's Close, Townend Close, and South and North Mires Close, and for the rectory he gave the house now known as Old Rectory Farm, "all that modern built Bricked, Tiled and Sashed House or Tenement late in the tenure of - Hescot (E and D on map) and the Great Barn standing on Clark's Close No. 22. The Trustees of Brewer's Charity gave to Pocklington the Marsh and Holt (No.12) and nine acres of Pastures and Carr, "also all that Messuage or Tenement in Winthorpe commonly called the White House with the garden and orchard adjoining, having the Gainsborough Road East, the said Roger Pocklington and the late Widow Sudbury West, the road leading to the Rectory North" (i.e. the old Lane) "and the said Roger Pocklington South." The site of the White House is easily identifiable from the map as standing at the bend of the Gainsborough Road just inside the gate of the present Academy garden ("O" on map). The lane became disused for part of its length once it was private property and it was later diverted to become a carriage drive only. 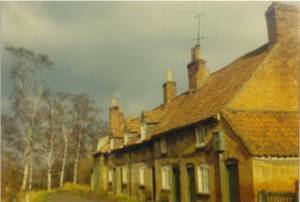 In return, Pocklington gave to the Trustees of the Charity the house, garden and west part of Clark's Close (No.22) of which Widow Skelton had been the late tenant, the closes marked 32, 33 and 37, and four acres of land dispersed in the Rundles. This one house was later extended into the row of Almshouses, we have today. Many other points were covered by the commission, e.g. the responsibility for planting hedgerows and maintaining fences, gates and roadways and repairing the riverbank. Unfortun­ately, the key to the map concerns acreage primarily, and some of the owners of properties, unless they are specified in the map itself, are unknown because the situation is not described. Morley's Homestead appears to have been a substantial property. Christopher Morley was a churchwarden and overseer of the, poor at the time, and his house appears to be roughly where the Grange stood later. The drawings of houses on the map are symbols rather than pictures but the relative sizes are indicated by the number of chimneys, barns and sheds are shown in plan-form only. (a) The building with a small spire in an area called "Chapel Yard" immediately opposite the Hall. (b) The large and evidently substantial building shown at the foot of the map at the entrance to the village. With regard to the chapel, it appears that it cannot be associated with Methodism, because at that time the followers of John Wesley held services only in private houses or in the open air, and in any case the spire is evidence against that idea. On the other hand, it seems unlikely that it should be a private chapel for the Hall, since the Taylors and Pocklingtons are all buried in the church. The chapel was not included in the Howlett drawing of "Views in Winthorpe" and does not appear on any of the later maps. 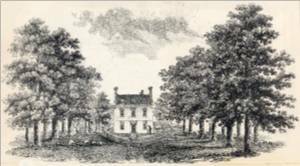 The large building on the edge of the garden area (No.28) and the Stable-yard does not exist today, but appears to be where Mr. M. Leach's house now stands. It has been suggested that it might be the house of Robert Heron, who was known to be a property owner in Winthorpe in Dr. Taylor's time, but there are no chimneys. It is particularly easy to identify the Dial House on the corner of Holme Lane and Gainsborough Road. 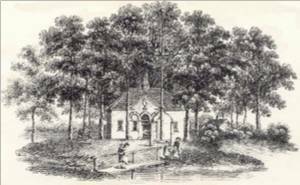 (It is now occupied by Mr. J. Wenn and was the School House in the Howlett engraving. At that time, 1807, it was a single-storey building, but at a later date had a second storey added, as can be seen by the change in the brick-work.) The Dial House, like many houses in Winthorpe, incorporates part of a much older house; in fact with the Lord Nelson Inn it may be the oldest remaining in the village. In this part of the east midlands, where there is little stone, most domestic building is red-brick. The earlier wattle and daub houses would not survive, and by now only fragments of pre-seventeenth century houses may be found incorporated in much later buildings, and behind the plaster in many parts of them might perhaps be found the earlier timber frame filled in with bricks. As there is nothing now remaining of Brewer's "new White House," the earliest description of a dwelling-house in Winthorpe appears in a Terrier of - 1714, in the County Record Office. This document, an inventory of church property, mentions the parsonage. "One dwelling house consisting of four bays of Building newly repaired and Barn and Stable consisting also of four Bays of building in very good repair. One garden lately taken in and Planted with fruit trees." This description was expanded in a later Terrier of 1764, to read: "Parsonage House built of Stone Mud and plaster covered with Thatch containing four low rooms, four Chambers ceiled with plaster, one Barn built of Stone and mud and covered with Thatch all in good repair with Orchard Homestead and Garden." This rectory tallies by its description with the building mentioned in the exchange which was made at the time of the enclosure award, where the Rev. Clement Griffith identified its position as being by the present coach-drive to the back of the Hall. It seems odd that the parsonage house should have been so far away from the church, so this building may itself not have been the first rectory. 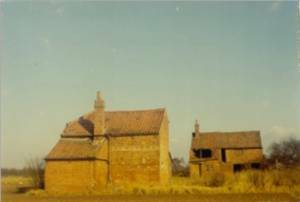 This mud and thatch house was exchanged with the "modern built Bricked, Tiled and Sashed House" which is now Old Rectory Farm in the occupation of Mrs. F. Baggaley. There is a stone tablet over the door "The Old Rectory" but in point of fact it was never occupied by the Rector. The reason for this was that at the enclosure lands were awarded to the Rector in lieu of nearly all the tithes, and these lands to have any value, had to have a farmhouse. So the Rector, in order to have an income, had to manage without a house, and from then on for many years the rectors sometimes lived in Newark or rented a house in the village. 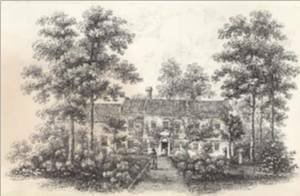 This farmhouse, named "The Rectory" in the Howlett engraving of 1807, is still easily recognisable as the same building today, except for the enlargement of the dormer windows and the addition of two bay-windows, and the beck still flows past the garden. The Rev. Edward Handley, at the celebration lunch following the consecration of his new memorial church in 1888, mentioned that until then the "rector was an outcast. He had no home and had to find lodgings in Newark or put up where anybody would be good enough to let him have a room to sleep in." However, by selling some of the glebe land and with the help of a grant from Queen Anne's Bounty, it had been made possible to buy a house in the village, then occupied by the curate-in-charge the Rev. W.C. Leeper and now occupied by Mr. G. Appleby and called "The Old Rectory." This consists of two properties, one older than the other, which had been bought by George Harrison Gamble in 1814 from George Bellamy and later converted into "one messuage" in the 1870's. The copyhold had been acquired earlier from the Dukes of Newcastle, and among his documents Mr. Appleby has the one reproduced in part with this article and showing the signature of Mr. W.E. Gladstone, who was at the time a trustee for the Duke of Newcastle who was a minor. (Mr. G.F.P. Thornhill holds a similar document among the deeds of The Grove.) This house remained the Rectory until 1960 when the builder of the Spinney development, Mr. H. Foster, sold his modern house to be the present Rectory. Mention of the present Rectory draws attention to the Grange, which was demolished when the Spinney was developed by Mr. Foster. The Grange, as can be seen from the photographs we show, was latterly a large, rambling Victorian house, which in the earliest form we know, on the Enclosure map, was Morley's Homestead, a farmhouse, and which is shown on the Howlett engraving a a neat square house with dormer windows. It was much extended during the nineteenth century, and at the sale of the Winthorpe Hall estate in 1867, it was occupied by Mrs. Branston and was sold to her for £1,400. 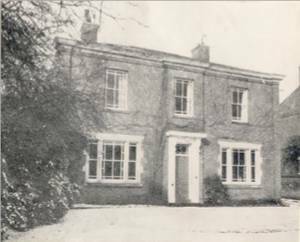 It was further extended in 1875, and the house was still occupied by the Branston family until the nineteen-twenties, but latterly by Col. Higgs. On the death of Mrs. Higgs in the early fifties, the house and land were sold for development and the house was demolished. A number of fine trees and some remains of the orchard can still be found in some of the gardens of the Spinney houses. The Grange stood across the right hand road of the Spinney development and across the site of the houses between the two roads. Its position can be roughly fixed by the large cedar tree which stands in the present Rectory garden, and which can be seen on the right hand side of the Grange in the photograph. The present Rectory incorporates a quantity of bricks from the old Grange, and the stables and coach-house stood at the roadside where there is now a village shop. The wall outside the house now known as The Coppice is the original wall, but lower. 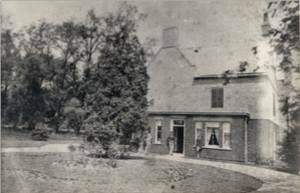 Mrs. Marson's house is the original lodge for The Grange, but the drive from the main gate ran across the present lodge garden. 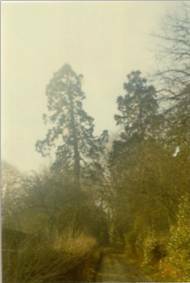 Miss Euston remembers the row of elm trees, which bordered the garden towards the church and a wonderful display of daffodils underneath them in spring and along the drive between the elm-trees. In fact, most people we have spoken to who remember the Grange mentioned this remarkable show of spring flowers. Miss Joan Branston recalls the tall staircase rising from the front hall to the topmost storey and the carved acorns set in the bannister rail to prevent the children sliding down. Winthorpe House is not shown by Howlett in his engraving of 1807. The building entitled "Winthorpe House" there is actually Winthorpe Hall, and the present home of Mrs. R.A.G. Stewart was at one time known simply as "The House." There is no building shown in that exact site in the Enclosure Map, although there may have been a small house there in 1807. (It is possible, too, that at the time permission was not given to the artist to make a drawing.) Local histories state that Sir William Gilstrap, head of the well-known firm of maltsters, bought the property in 1855, but as it was not sold by Lord Middleton until 1867, it is probable that Sir William leased it only. He did not in fact live there; his home was Fornham Park in Suffolk, where he used to hold big shooting parties and often entertained Prince Albert Edward who later became King Edward V11. "The House" was occupied by his younger brother Mr. George Gilstrap, who was tragically killed by a train at Newark station when he was still quite a young man. 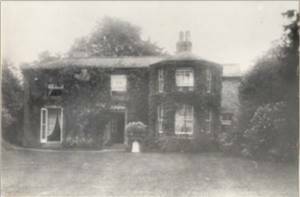 His widow and three small daughters remained in Winthorpe, and Miss Fiona Stewart believes that it was Mrs. Gilstrap who was responsible for laying out much of the beautiful garden. The original house was small and square with an interesting pediment contain­ing an arch with an attractive front door. This section is built on a slight curve, which is its unusual feature, even the panes of glass following the curve. The house was later extended in two stages, the first of which can be seen in one of the photographs, where it is still possible to see the original shape of the house. The extensions to the house must have been made after 1867 when Mrs. Gilstrap bought the property, and in fact Miss Stewart believes these were planned by her great-aunt, Miss Josephine Gilstrap, one of Mrs. George Gilstrap's three daughters. It is noteworthy that the basement area was excavated after the other considerable alterations had been made. There is a plan of a proposed lay-out of the gardens, dated 1883; this was modified but the garden was probably finished in the 1880's, when the church was in process of demolition, because there are in the extensive rockery fragments of carved stone and sections of tombstones which had been broken at the time. Some of the older gardens in the village contain similar fragments. 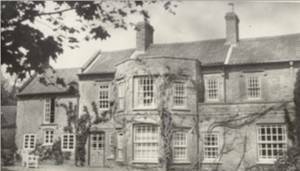 The Grove was built just before the end of the eighteenth century by Roger Pocklington for his son Roger on his marriage. The house may have been designed by the same architect who finished Winthorpe Hall because they appear similar in style in the early prints, just as there are similarities between Winthorpe Hall and Carlton Hall, which was also the property of Roger Pocklington at one time. 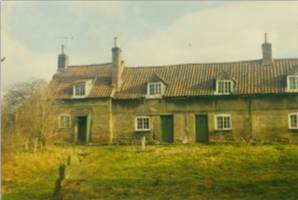 Unfortunately as with many of the older houses in Winthorpe it is difficult at present to record much of its early history without access to the archives of Winthorpe Hall. After the decline in the fortunes of the Pocklington family in the first decade of the nineteenth century, the house seems usually to have been rented from the owner of the Winthorpe Hall Estate. Mr. J.I. Marfleet (maltster) was living at "Grove House" in 1832, and Wright's Directory mentions Mr. C.C. Foottit as living there in 1861, but at the Winthorpe Hall Sale in 1867, J. J. Marfleet was the tenant and bought the property for £2,500. Later, before the long tenure of the Branston family, Lady Wilmot lived at The Grove. At some stage - no doubt after the sale in 1867, the house was enlarged by the addition of extra wings. Mr. Peter Thornhill the present owner, in the course of some recent restoration work, came upon some newspapers dated 1899, which may suggest that the alter­ations were made at the turn of the century. Low Wood is now occupied by Mr. W. Packe and facing south-west overlooking the by­pass, has for most of its existence been a farm. It was built by Roger Pocklington for a home farm and over the front door there is still a stone tablet which reads: "The first stone of this house was laid by Roger Pocklington junior and his sister Elizabeth June 25th 1787, aged 11 years, aged ten years." Mr. Packe thinks that there was already a small house on the site and that Roger Pocklington incorporated this into the Georgian farmhouse which can be seen in the Howlett engraving. A nineteenth-century owner removed the pediment with its sundial and added a veranda, and the stone face of the sundial is now part of the paving of the veranda. The Nelson Inn is one of the oldest remaining houses in Winthorpe. There are in early court records references to an inn or innkeepers in Winthorpe, but as inns were seldom named it is not possible to say whether the site is the same as today. It is believed that before the early nineteenth century it was called "The Turk's Head" and that the name was changed after Nelson's victories. Howlett's 1807 drawing of the centre of the village certainly shows a tall standard carrying a portrait of the Admiral's head. From the end of the eighteenth century until quite recent times the publican at The Nelson has usually been a small farmer as well, latterly farming the area of the Park and using the buildings by the Lincoln Road that formed a complex with the Bleach Houses until they were all demolished during the last war. Mr. Alec Gosling, the present landlord, has an old brass tally worth 1½d., and bearing the name of The Nelson Inn, which would have been given by a farmer to one of his labourers to exchange for beer at the inn. The inn, together with the cottage (last occupied by Mrs. Ackroyd) which stood until recently on the site of the present car-park, both appear on the enclosure map, and both buildings probably dated from the seventeenth century or earlier, and both had their own brew-house. The lime tree on the village green outside the Nelson was probably planted in celebration of Queen Victoria's Diamond Jubilee. So far no reference to any such planting has been found, but the tree is not shown in Miss Branston's painting of the Green dated 1891 and the photograph dated 1909 (from Newark Museum) shows the tree not yet fully grown. Dial House or The School House, at the corner of Holme Lane, has been described as one of the oldest houses in the village dating back to the 1760's. It appears on the enclosure map of 1775. The house is shown in the Howlett drawing as having only one storey, with a Ashlar sundial on the front elevation under a central pediment. A second storey was added later and the sundial was retained, the change in the brickwork, from old narrow bricks to wider, can clearly be seen. In the garden behind the house once stood an elm tree described in many nineteenth century directories as thought to be the largest in England "and upwards of one hundred years old." (White 1853) It stood 96 feet high and measured 40 feet round the trunk. In the enlarged section of the enclosure map a large tree is shown in the area behind the School House (or "Old Yard.") This is possibly the elm tree described as it is drawn as a large rounded tree, quite different from the conventional symbols used to show the lay-out of the plantations; there is no other like it on the map. White's Directory of 1885, after describing this huge elm tree, goes on to state that it was taken down in March 1852 because it was decayed. It was found to contain 1,321 solid feet of timber. "On the 13th of the same month and year a young plant from the old tree was planted by Miss Handley, the eldest daughter of a former rector." There seems no reason to doubt this date, and although the 1867 sale map still shows a large tree behind the schoolhouse, this may simply have been copied from the enclosure map of Pocklington's estate. In the present garden there is an old elm, which might be the one planted by Miss Handley, but it is a weeping-elm and seems unlikely to have been a cutting from the original tree. In Howlett's drawing of the centre of the village, of which an enlargement can be seen, the village cross can be seen on the far side of the carriage bridge over the beck. In addition, outside the School House there can be seen a tall pole with three-fold support (similar to the one outside The Nelson Inn). The cross and the pole outside the school are both shown on the enclosure map, but it is difficult to discern what the pole can have been -a maypole perhaps? There is also in the drawing a stone archway beyond the cross, which may have housed "the town's pump," to which reference is made in nineteenth century records. These form an attractive row of old cottages on a sunny bank facing Holme Lane. As will be seen from the account of Brewer's Charity, part of the row was exchanged at the enclosure in 1775 for Thomas Brewer's White House, for which Roger Pocklington gave "all that messuage or tenement in Winthorpe aforesaid late in tenure of Widow Skelton, with the garden and west part of Clarks Close thereto adjoining." This cottage had others added to it to complete a row of five. The charity accounts detail sums spent on building "the new houses in the years 1809-1812, but Dr. Norman Summers who has inspected the almshouses, thinks that some of them in addition to the middle one (Widow Skelton's) are older than that. Only two of the houses are now occupied, and a closure order has been placed on them all, but it is hoped that they can still be preserved after restoration and conversion. On the Green in front of the almshouses there can be seen the stump of the old village cross, a preaching cross, raised on a brick plinth. It is all that remains of the cross, which once stood in the centre of the village near the bridge over the stream. 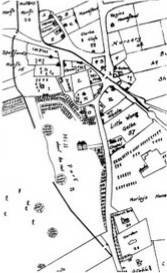 It is clearly mark on the map of 1775 and can be seen in the Howlett engraving showing the village. 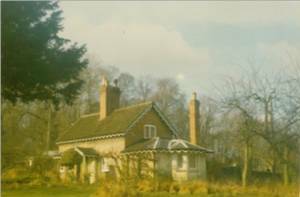 The Academy has for part of its existence been also known as "The Cottage" giving rise to some confusion with another "The Cottage" standing in the grounds of Winthorpe House. Its origins, like those of several other old houses in Winthorpe, are entangled with the early history of Winthorpe Hall, to which estate it belonged at the time of the enclosure. On the award map it is shown as a simple one-chimney house, but it is plain that the original narrow house has been extended by the addition of a second gabled house, so that one stands behind the other. 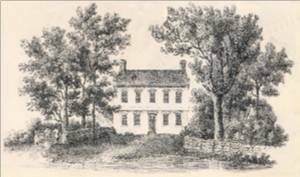 The house appears as "The Academy" in the Howlett engraving of 1807 and there was certainly a schoolmaster named Henry Robinson living in the village at that time, in addition to the charity-schoolmaster. Later, a roof-high bay was thrown out and the front door moved. The Rev. William Handley lived in the house for some time while he was rector, renting it from the owner of the Hall Estate, Lord Middleton, and for some years from the turn of the century on it was occupied by the Rev. G.W. Oxenham, brother of the novelist, John Oxenham. It is now owned by Mr. G.P. Bennett. 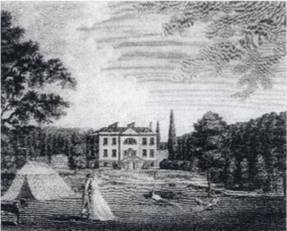 In the present garden stood Thomas Brewer's White House, when the old bridle road ran between it and The Academy. The ruins of the White House, which was last occupied by a tailor and shop­keeper called Johnny Cawthan, were still standing in the 1870's. Mr. Euston recalls coming upon the foundations and rubble when he planted trees in that part of the garden in 1907. The remaining buildings shown on the Howlett engraving include The Green House, which can be seen to the left of Winthorpe Hall in the engraving of 1791 and also in Howlett's own drawing of the Hall. This appears to be a summerhouse or type of orangery, which no longer exists. Francis White's Directory of 1853 states that "In the grounds of Winthorpe Hall there is an octagonal temple with a table made out of the wrecks of the Spanish floating batteries, destroyed in the memorable attack on Gibraltar." It is uncertain whether this is the same building. The Rev. C.W. Griffith wrote in 1900 that there was no trace of any "temple." Fort Elliot is also a problem. Mr. Burton recalls having been told at a young man that Fort Elliot stood on White Apron Hill, the rising ground between Winthorpe and Newark, towards the end of Stephen Road. This would suggest a connection with Crankley Point and the Civil Wars, but it does not appear on the siege plans and is so far outside Winthorpe as to make it doubtful whether Howlett would have included it among the "Views of Winthorpe" which he had dedicated to Roger Pocklington. An alternative opinion suggests that it was a "Folly" erected either inside the grounds as a feature of the garden, or perhaps indeed erected on White Apron Hill (if Pocklington owned land there) to make a focal point in the view from the front of the Hall, between the trees. It will be recalled that in the preliminary announcement of the sale of effects at Winthorpe Hall in 1809 one item was "Three pieces of Cannon on Carriages." There is no reference to Fort Elliot that we have so far discovered in Civil War records or in later Directories. Another suggestion is that is was built by Roger Pocklington to celebrate the succesful Defence of Gibraltar in 1782. The Bleach or Bleaching Houses, no longer exist except as a name on the ordnance survey map, stood beside the Lincoln Road near the bridge over the by-pass, in an enclosure of scrub and overgrown hedges which can still be seen by the entrance to the green lane which leads back to the village past Low Wood. This was a complex of farm buildings and a row of cottages, which stood until after the outbreak of World War 11. The name obviously is related to the local industry concerned in growing flax and weaving linen. No Winthorpe village records have so far been discovered which mention flax or linen, but flax was certainly grown at Besthorpe and Collingham. Seventeenth century parish accounts at Besthorpe show that much flax was sent to Newark for bleaching and weaving, in addition to what was processed in the parish itself. (The raw material was much used for the purpose of "setting the poor on work.") Linen manufacture carried on at Newark was one of the chief textile industries of the county in the mid-nineteenth century, one hundred weavers being employed in Newark by Messrs. Scales & Son. In the main it was a cottage industry; in 1790 in Besthorpe weaving was paid at 3d. per yard and bleaching at 2d. per yard. Latterly, the Bleach Houses consisted of a large block of three cottages and Mrs. A. E. Kingdon, who was born in one of them, remembers that they seemed to have been divided vertically into three, from one long room on the ground floor and one long room on the first floor. The farm buildings nearby were used to work a small farm, which formed part of the Winthorpe Hall estate, this farm was run by Mr. Barrow who also kept the Nelson Inn. After the beginning of the war some land-mines were dropped on the airfield. Only the cottage windows were broken but the buildings were considered to be a hazard to aircraft and the Air Ministry ordered that they should be demolished. Two-mile House, which stood at the point of the present Winthorpe roundabout, and Carr Farm in the middle of the present airfield, also disappeared when the airfield was built. The Mill and its cottage stood in the fields between the village and the Lincoln Road, approached by a raised causeway. There is no trace of the windmill on the enclosure map, and none on the sale map of 1867, although this may be because it was not concerned in the sale. It was certainly in existence in the early years of the nineteenth century as the property of Mr. G.H. Gamble, a farmer and miller. White's Directory of 1853 states that Mr. Gamble had attached a steam engine of 7 h.p. 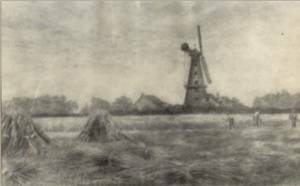 to his windmill in 1846; this was an up-to-date method of keeping the mill working whatever the weather. Unfortunately Mr. Gamble once persuaded one of his men to sit on the safety valve to increase the pressure, and there was an explosion "with fatal results." Mr. Euston remembers the mill standing in 1907 but cannot recall whether it was still in use. It was demolished many years ago, leaving only a circular mound to pinpoint the site. The mill cottage was occupied until recently by Miss Bellamy and her brother, but it was con­demned and it is now being demolished. In the village there are several houses, which are probably older than they appear to be. For instance, Mr. A. Hickman's house is an old one with a Georgian face, the gable end showing the old narrow bricks and the line of newer bricks on the facing. The late Mr. R. Speight, who once lived there, believed that the house had once been an inn, but unfortunately he did not leave any note to explain his reasons for thinking so. The house was once part of a small-holding, of which the neighbouring cottage (occupied by Mr. Coupland) was an agricul­tural labourer's. Both houses are roughly on the site of, or incorporate, buildings marked on the enclosure map of 1775. "The Lodge" now occupied by Mr. R.P. Stammers and once Mrs. Morgan's family home, is not one of the houses on the mid-nineteenth century maps although it has a late Georgian appearance. The late Mr. R.H. Bradley believed that part of it had been used as a school at one time. There are also some mid-Victorian residential houses, and cottages for estate workers. The cottage occupied until recently by "Granny" Birch, near the corner of Hargon Lane, was formerly a bakery with a little shop, and appears to be on the site of "Vazin's Home­stead" on the enclosure map. "The Cottage" which stands between it and Winthorpe House was earlier the cottage for Miss Gilstrap's coachman, and although not plainly identifiable on the enclosure map, it is certainly present on the 1867 sale map, as is also "Wheatley House", now by Dr. T. Jeffries, the former dwelling of the last Camamile in the village to be a carpenter and wheelwright. The two cottages on Holme Lane facing the almshouses, now occupied by Mrs. Groves and by Mrs. Mansell, are clearly those indicated on the enclosure map. One of them had a black­smith's forge attached to it during the nineteenth century and perhaps earlier, and both were for a time church property, although they are now owned by Alderman G.R. Walker, who lives at a house next to them, which appears on the 1867 sale map. Along the coach drive to the Hall are some cottages, which were once occupied by workers on the Winthorpe Hall estate, either at the Hall or on Rectory Farm. At the Holme Lane entrance to the coach drive there is on the right-hand side an attractive type of nineteenth-century cottage orné (once thatched perhaps?) and near to the Wellingtonias there stands a cottage which is now condemned but which may well be "Simms" house marked on the enclosure map (but with the drive diverted from front to back). This cottage has some old stones incorporated in the front wall. Could this stone be ex-Tudor Rectory (which stood at a distance behind it) or ex-Rectory stables? Both were described in the award as being made of "stone, mud and plaster." Since World War 11 there has been much new building in Winthorpe. Four army officers' quarters were built in 1955, and beside them eleven council houses were built in 1955. 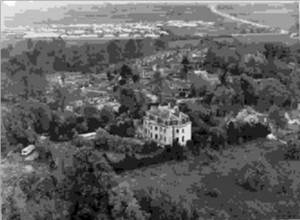 At about the same time, after the death of Mrs. Higgs the Grange estate was sold, the house demolished and The Spinney developed by Mr. Harry Foster. The same builder developed the Woodlands estate at the opposite end of the village during the 1960's, on land, which had belonged to Ringwood, a Victorian house built by Mr. Bailey the auctioneer. During the last few years there has been a great deal of in-filling and a new estate has been planned on twenty-five acres along Hargon Lane. The centre of the village around the Green, has been listed on county plans as being intended to retain its village character. The Grange in Volume 4. Bleach Houses in Volume 4. Winthorpe Hall in Volume 4. Bartholomew Howlett in Volume 4.